CANCER IN DOGS AND CATS: FREE, MUST-SEE DOCU-SERIES. SIGN UP NOW! But, cancer can be prevented. I published this blog about pet cancer prevention 2018 back in April of last year. As soon as I heard about this free documentary series of seven episodes, I just knew that I had to postpone my blog for that week. The news was so significant I wanted my readers to take action and sign up. The objective was to learn about a topic that affects far too many of our companion dogs and cats. Quite shockingly, statisticians estimated that in 2018, 1 in 1.65 dogs and 1 in 3 cats would die from cancer. Unfortunately, while this is devastating news , it is not altogether surprising. Why is that? Because, in recent decades, researchers have focused almost entirely on how cancer affects the human species. And, they have done comparatively little to highlight how this insidious disease impacts pets and pet parents. Besides, the number of diagnoses and the mortality rate have been steadily rising to alarming levels without the attention it warrants. Effective cures for the different types of cancers that affect canines and felines is one thing. But, taking steps to help prevent cancer cells from forming in the first place, makes perfect sense. The above data gave rise to an exhaustive study and to then present the findings in a prevent pet cancer documentary. Broken down into seven episodes, you can view them over the next seven days starting on Wednesday April 4th. 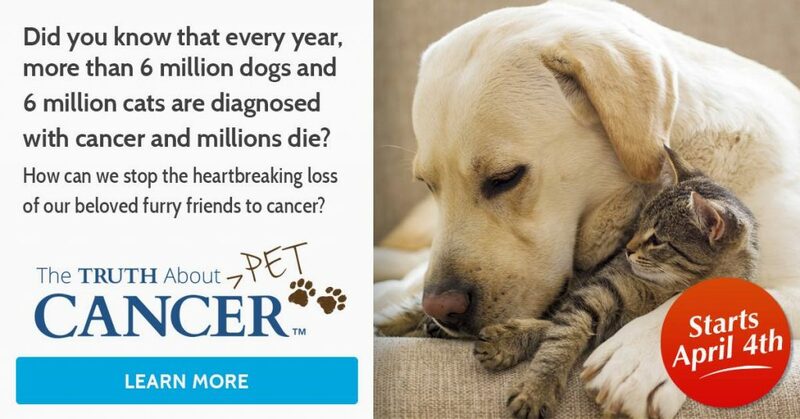 The docu-series entitled The Truth About PET Cancer was created by Ty Bollinger, Co-Founder of The Truth About Cancer, whose mission is to eradicate cancer from the face of the planet. In humans and animals. Those who participated in its making include over 30 world-renowned veterinary oncologists, holistic veterinarians and animal health specialists. The episodes will run from April 4th thru the 10th and below is the program of topics. If you are unable to watch the docu scheduled for release on the day and at the exact time specified, do not worry. You have a 23-hour window to do so before the next docu is made available. This video is an important part of the fighting cancer message and I urge everyone to play it. I hope it encourages you to research the many aspects of this topic. Furthermore, I am confident you will find some of the answers you may have been looking for yourselves.